The unexpected, drought-busting rainfall of recent weeks has left many UK areas on flood alert. Across the UK Twistfix has received a sharp increase in orders for its Roof Seal Paint as leaks in roofs and roof coverings have been made more prominent by the record levels of rainfall. Don’t wait for a rainy day to find out if your roof is fully sealed and watertight! The roof is the primary waterproof layer for any building and, to keep it in good condition, it is important to keep it well maintained. If a leak occurs and water marks appear on the walls or ceiling of your home, much of the damage may already be done and costly repairs may follow. That is why it is important to act before your roof is in a desperate need for attention and repair. 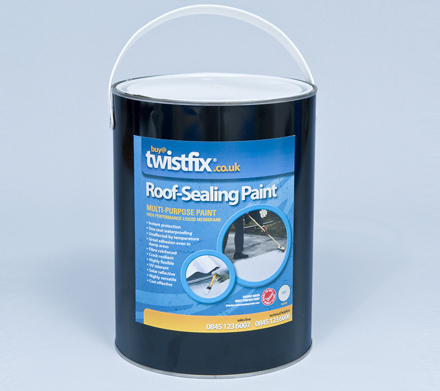 The high performance roof sealing acrylic coating is Twistfix’s best-selling damp proofing paint. The one-coat paint can be used for both emergency and permanent repairs for leaking roofs. It can generally be used without a primer and has the ability to be applied in damp conditions on most surfaces. 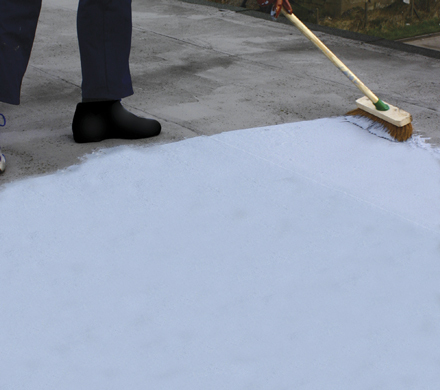 The roof sealer will waterproof instantly, even while wet, and will not wash off while curing. Reinforcement fibres dispersed in the paint allow the acrylic roof coating to seal and waterproof cracks and perforations in roof coverings that are up to 10mm in width. The acrylic coating is extremely versatile and is use to repair leaks on flat and pitched roofs, corrugated asbestos, roof lights, gutters, valleys and flashings. Roof Seal Paint can be directly applied with a single coat to repair leaks in asphalt, roofing felt, slate, lead, glass, metal and fibreglass. Every builder and roofer should carry a can of this remarkable waterproofing paint in his van. 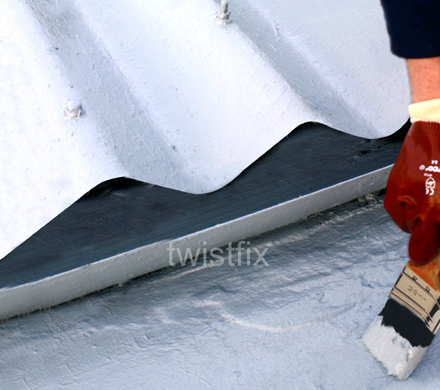 Twistfix supplies an array of roofing products to maintain, repair and waterproof your roof. For more information on roof paints for sealing leaky roofs please contact us on 0845 123 6006 or email sales@twistfix.co.uk.